Organization Chart is an add-in for Office programs that you can install and add to your Word document, PowerPoint presentation, or Excel worksheet. There haven’t been any significant updates to this add-in since its release in PowerPoint 1995. Note: To learn about other and better ways you can create an org chart in Word, Excel, PowerPoint, Outlook, or Visio, see Create an org chart in Office. In Windows, click Start , and then click . Note: If you don’t see Programs and Features in Control Panel, see Windows Help and Support. Right-click Microsoft Office 2013, and then click Change. In the Microsoft Office 2013 Setup dialog box, click Add or Remove Features, and then click Continue. Click the plus sign (+) to expand the Microsoft Office folder. Click the plus sign (+) to expand the Microsoft Office PowerPoint folder. 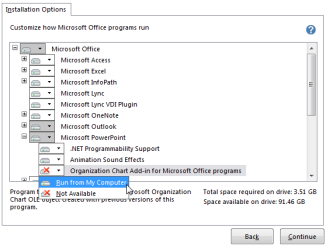 Click Organization Chart Add-in for Microsoft Office programs, and then click Run from My Computer. Click Continue to install the add–in. Open the Organization Chart Add-in for Office. Note: You only need to install the add-in once to use it in Word, PowerPoint, and Excel.